Welcome to Cozumel in Mexico! Cozumel is an island in the Caribbean Sea off the eastern coast of Mexico’s Yucatán Peninsula, opposite the popular tourist destination of Playa del Carmen, and close to the Yucatán Channel. Cozumel is just one of over 60 official online guides covering the whole of Mexico. If you´re planning a trip to Mexico and would like discover our fabulous nation before visiting or, if you´d like to visit a specific place in Mexico, then you´ve come to the right place. Cozumel is one of the ten municipalities of the Mexican state of Quintana Roo. 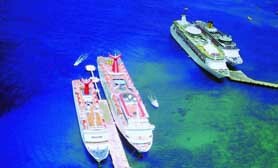 Cozumel is popular tourist destination for its pristine beaches, scuba diving, and snorkeling. Cozumel Island is one of Mexico´s most popular places, visited by millions of people over the last decade. When you travel to Cozumel you may wish to check out the Cozumel hotels we have available or maybe you´d like to rent a car in Cozumel? We also offer extensive day trips in Cozumel. This unique place has simply amazing. We´ve also compiled a list of Travel books on Cozumel Mexico. The main town on the island is San Miguel de Cozumel. The name Cozumel is derived from the Yucatec Mayan word Kùutsmil, Mayan “Cuzamil” or “Ah Cuzamil Peten” which translated into English means Island of the Swallows. The island was probably named as such by Mayan natives, due to the migrating swallows using the foliage and tress as a nesting ground and, naturally safe haven from land based predators due to the fact it is an island. Whether you are visiting Cozumel in Mexico for business, pleasure or both, we´re sure that Cozumel will meet all of your expectations and that the people of Cozumel will make you feel welcome while sampling some of the unique cuisine on offer in the Cozumel Restaurant districts. Cozumel offers dazzling white sandy beaches and the remarkable clarity of the multi-hued azure Caribbean ocean in which it calls home. The weather is subtropical & the people natives to Cozumel are all of Mayan descent. The Maya were a culture of farmers, fisherman & warriors who ruled from Campeche to Guatamala for over 2000 years before the arrival of the Spanish Explorers in the 15th Century. They were an advanced civilization, and the legacy of their culture survives in the vestiges of the huge cities that they built during their reign. One of the lesser known sites on the island is called San Gervacio. More recently turned into a park with a restoration project to study the Mayan culture, this was once a sacred Mayan site where Mayan women traveled to worship the goddess Ixchel, the Mayan goddess of fertility. Other captivating sites such as Chichen Itza and its massive pyramids that rival those at Cheops, and Tulum, is located at the only Mayan city built overlooking the sea, and even Tikal in its vibrant jungle settings where wild monkeys still roam, each are an easy one day excursion from Cozumel or Cancun. 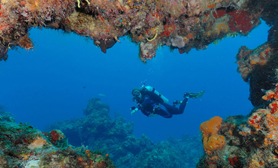 Cozumel was just a tiny little fishing community until 1961, when the revered French diver and discoverer Jacques Cousteau declared Cozumel as one of the most beautiful scuba diving areas on the planet. Since then Cozumel has become an underwater marine park to protect the delicate balance of its alluring coral reefs & abundant variety of tropical fish. Its underwater wildlife is absolutely wonderful due to the clarity of the water, you do not have to be a diver to enjoy the underwater life and even with a snorkel and some fins you´ll see lots of marine life. 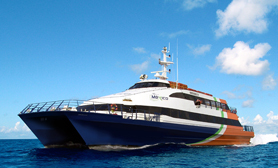 Cozumel´s main ferry operator “Mexico Water Jets” transports you from Playa del Carmen to Cozumel Island in about 35 min. Their fleet of air conditioned passenger ferries with comfortable seating & music videos for the minimal cost of 15 to 20$. We now offer buses on our day trips & excursions page that will take you directly to Playa Del Carmen from the Cancun airport if your vacation is solely at Cozumel these are very convenient. The bus can be arranged just as you leave the airport terminal. If you´re in Cancun however, the trip to Playa takes about 1 hour on the excellent highway. 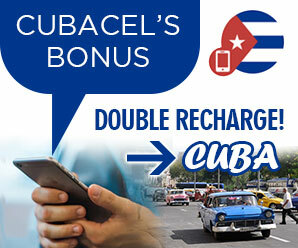 Alternatively you can rent a car in Cancun & come over on the car ferry. This is a little expensive, about $50 US each way but affords more freedom to discover the island where rental cars are a little more expensive. Be sure to check the schedules carefully to be sure you can cross when you wish and keep in mind that renting a car once you arrive in Cozumel is also possible on our Cozumel car rental pages. Cozumel Carnival or Carnival de Cozumel has been a 139-year tradition that fills Cozumel’s streets with numerous parades. It begins the week before Mardi-Gras and Fat Tuesday in February. Carnival Cozumel is an annual event, and the dates are normally the week before Ash Wednesday and usually begin about 6pm and go along the waterfront street, Avenue Rafael Melgar, from the area of the Palacio Municipal all the way through downtown to the Airport Road. The costumes, floats and dances at the Cozumel Carnival are really amazing as they turn around at the Airport Road and return. The island is about 48 km (30 mi) long and 16 km (9.9 mi) wide, and is Mexico’s largest Caribbean island. It is Mexico’s third-largest island, following Tiburón Island and Isla Ángel de la Guarda islands in Baja California. Cozumel is located some 10 km (6.2 mi) from the mainland, and 90 km (56 mi) south of Cancun and is easily reachable by regular fast water taxis or regular ferry services. The vast majority of the population of Cozumel lives in the town of San Miguel which has an approximate population of 78,000 and is on the island’s western shore. The municipality, which includes two small areas on the mainland situated within the Municipality of Solidaridad with a land area of 10.423 km² (4.024 sq mi), has a total land area of 647.33 km² (249.93 sq mi) making it a relatively large island despite it’s the often mistaken concept of it being tiny. The land area is covered with an impenetrable jungle which has many endemic animal species. Cozumel Island, including offshore islets, has a further land area of 477.961 km2 (184.542 sq mi). The island is extremely popular year round and is a favorite excursion from the Cancun Hotel Zone. Duck Pond and Sistema Sin Nombre are two recently explored and named caves in Cozumel, Mexico whose length is 989 m (3244 ft), with a total maximum depth of 14 m (46 ft). Sistema Sin Nombre was first entered by Adam McDowell in June 2010 using a monkey diving configuration and restraining himself to a 50 foot spool. 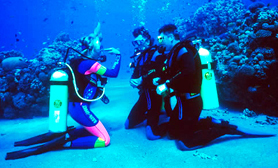 After McDowell saw the potential, he and Mike Young made the first dive using a side mount configuration. Earlier attempts had been made using back mount but the entrance was too slim to allow a back mount cave dive. Following to this dive, Adam and Mike returned to the cave and explored the virgin areas which now appear on various maps. Duck pond is located through a cavern extending from within the Sin Nombre Cenote. Apparently the main entrance was located on a construction site which restricted access until recently in 2013. Dos Coronas has a total length of 1070 m (3511 ft) with a maximum depth of 7 m (23 ft). 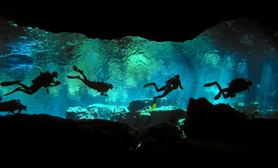 The Dos Coronas cenote was explored in 2011, 2012 and 2013. The main entrances are located off the coast of Cozumel and are easily accessible. The 2012 map credits naming seven surveyors and explorers and Jon Lillestolen is the cartographer of the current map which again can be easily found in Cozumel dive shops. Cenote Bambu has a length of 61 m (200 ft) and at its maximum depth it reaches 51.8 m (170 ft). 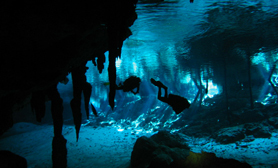 The Cenote Bambu cave was explored in early 2000 and is much like the Tres Potrillos Cenote. Maximum visibility in this classic sink is 3 m (10 ft). It appears that the initial entrance gallery is huge, yet poor visibility makes it extremely difficult to fully explore this deep cave. Furthermore, the floor of the cave presents a very deep and heavy silt which makes survey guideline tie-offs nearly impossible. Cenote Tres Potrillos is 94 m (310 ft) in length: 94 m. The maximum depth of the sink is 38.1 m (125 ft). Maximum depth of a connecting tunnel is 15 m (50 ft). The Cenote Tres Potrillos cave was discovered in 1998. The entrance is a series of very minor restrictions which opens into a very large classic sink chamber at – 9 m (30 ft). With no a daylight zone, the main chamber and its one connecting horizontal passage are rich in speleothems. Furthest penetration into the branching tunnel is 61 m (200 ft). The Cenote Tres Potrillos cave is on private property but is freely open to covers and simply requires an entrance fee. 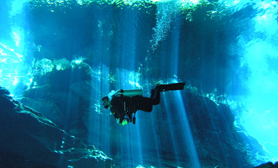 Cenote Cocodrilo has a Length of 2493 m (8180 ft), with a maximum depth of 17.4 m (57 ft). The cenote is blocked for diving unless permission is previously obtained by the landowner. The entrance is located on private property, and contains both Prehispanic and colonial artifacts. Cenote Cocodrilo has one cenote entrance, which is a short distance from the Caribbean Sea. Its entire length extends almost due east in upstream passage with a few side passage leads. Although the maximum depth of Cocodrilo is 17.4 m (57 ft), much of the explored cave averages 6.1 m (20 ft) in depth. Explorations in Cenote Cocodrilo continue to yield more going passage and, a detailed map of the cave is available at various specialist dive shops in Cozumel. Cozumel Another Website From Travelucion Yes Domains!